Inca Son, since its earliest beginnings in the streets of Harvard Square (Cambridge, Massachusetts), has been a band with a mission: to preserve and instill appreciation for their cultural legacy through the international language of music and dance. Dressed as either their Inca forebears, with feathers and gold earrings, or in the resplendent wool ponchos still worn in the Andes Mountains, Inca Son is, in the words of Boston Pops conductor Keith Lockhart, ?the indispensable cultural ambassadors of this nearly lost South American folk tradition. Their music is of the highest caliber.? They are one of the few bearers of the Inca musical legacy. With equally vibrant music, characterized by the distinctive sounds of the haunting pan-flutes or the lively charango (Andean ten-stringed guitar), Inca Son crosses barriers of language, culture, race, and age. It is a band with a truly universal appeal. 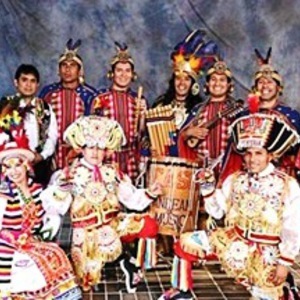 Inca Son is now recognized as one of the world's best world Traditional Music groups.